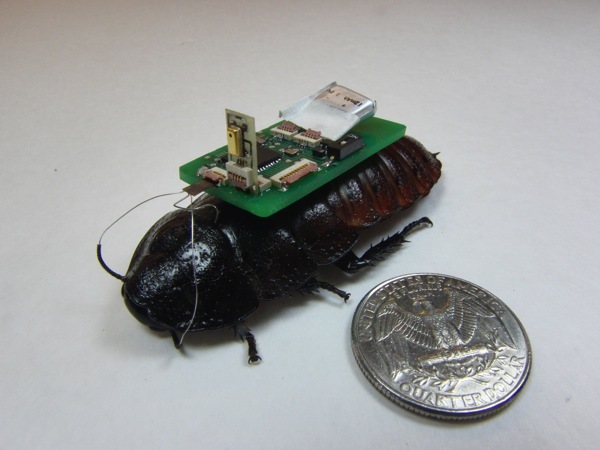 Cockroach Cyborgs Use Microphones to Detect, Trace Sounds « Adafruit Industries – Makers, hackers, artists, designers and engineers! Putting a slightly gross spin on the idea of “The Rescue Rangers,” researchers at North Carolina State University have further developed a technology to control cockroaches as biobots to pick up and determine the source of sounds. The technology is intended to assist in emergency rescue missions to assist personnel in finding survivors in need of help. The second type of biobot is equipped with an array of three directional microphones to detect the direction of the sound. The research team has also developed algorithms that analyze the sound from the microphone array to localize the source of the sound and steer the biobot in that direction. The system worked well during laboratory testing.